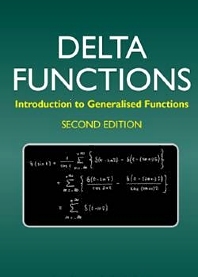 Delta Functions has now been updated, restructured and modernised into a second edition, to answer specific difficulties typically found by students encountering delta functions for the first time. In particular, the treatment of the Laplace transform has been revised with this in mind. The chapter on Schwartz distributions has been considerably extended and the book is supplemented by a fuller review of Nonstandard Analysis and a survey of alternative infinitesimal treatments of generalised functions. Dealing with a difficult subject in a simple and straightforward way, the text is readily accessible to a broad audience of scientists, mathematicians and engineers. It can be used as a working manual in its own right, and serves as a preparation for the study of more advanced treatises. Little more than a standard background in calculus is assumed, and attention is focused on techniques, with a liberal selection of worked examples and exercises.